Similar to my previous post on trying to wrangle social networks, I’m now struggling with how to integrate all these different, wonderful resources our students have for content generation. Three of these resources — Glogster, Symbaloo, and DiscoveryEducation — are getting some heavy airplay lately, yet they’ve primarily existed in isolation. Click inside to see just one way you can pull them all together into a meaningful activity. There are many different types of activities students can, and should, take part in during the course of a unit. They can discuss concepts with partners, take notes, write essays, create presentations, research information, and more. One such activity, Internet research, is difficult to implement, even when the teacher has a very clear idea of what he wants the students learn, what information he wants them to access, and how he wants them to present it (the final project demonstrating they met the objective). What is the content I want my students to research? Where do I want them to go to find it? What should the end-product look like, and how does it show they met the objective? For each of these, you’ll want the students to use a resource. The resource can be online, or it can be physical. For instance, I may want my students to research online the causes of the Revolutionary War, but I want them to write an essay explaining the 3 main causes of the war. Or, I will have my students interact with an atom simulator online, and then create a physical model, and present on the function and parts of the atom. In my case, I wanted to create something that existed solely online. For this, I answered each of the 3 questions with one of the web resources I listed earlier (DiscoveryEducation, Symbaloo, and Glogster). I want them to research the steps of Photosynthesis from a variety of sources: DiscoveryEducation and various web sites. 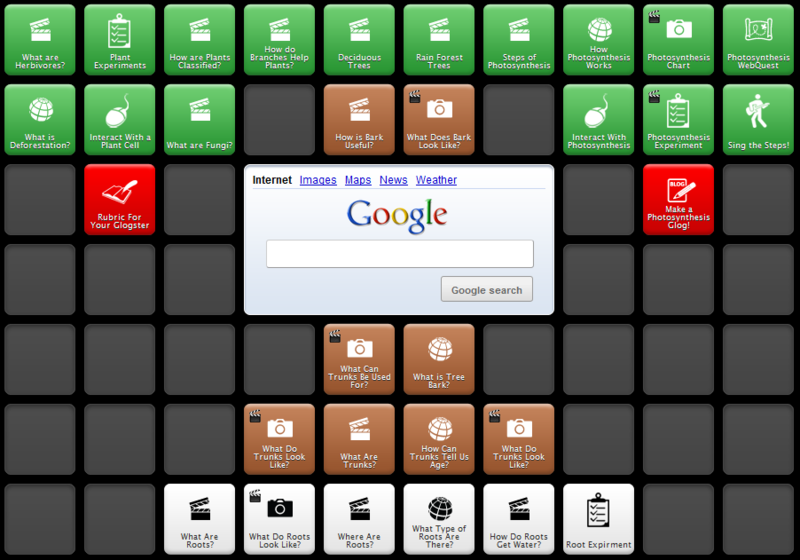 I want them to use Symbaloo to access only the content I’ve culled for them. They will create a Glogster with the steps of Photosynthesis. So, to that end, I created a Symbaloo that has videos from DiscoveryEducation, pictures from various sources, web sites, experiments, and simulations. All of them are possible resources for my students to use in creating their Glogster; however, not all of them should be a resource they use. If I were to simply give my students a list of 15 resources, and say, “Go,” they wouldn’t learn to evaluate the information they are exposed to. They would think that since it’s on the Symbaloo I directed them to, there must be something there they need to see or use. They would be wrong. I wanted to tame the wild Internet, to an extent, so that it’s manageable for my students — I didn’t want them staring blankly at a Google Search bar — but, I also wanted the to have to evaluate and assess the information they’re given. Create a Glogster demonstrating your knowledge of how Photosynthesis works. Not all of the videos, pictures, or websites on the Symbaloo are related to Photosynthesis. Some of them are just there to help you understand more about plants and trees. The information in your Glogster should only be related to Photosynthesis. Below are 4 requirements of your Glogster. You will receive 1 point for each part that is in your Glogster. The rubric is supremely objective, grading them simply on whether they have met the requirement, or not. The final point is something I picked up from Ainsworth’s Common Formative Assessments, who states that structuring your rubrics in a very objective manner alleviates the possibility of teacher subjectivity, varying interpretations of the rubric, and student confusion over what they are being asked to do. With that in mind, students are sent off to complete the activity. It can be used as a summative assessment at the end of the unit. It can also be used as an on-going resource throughout the unit, where students don’t access all the resources in one or two days, but as they are introduced in the classroom. Students can then add to their Glogster during the course of the lesson, and can even engage in discussions about which resources are necessary, optional, or irrelevant. However you choose to use it, I hope you see some value in it. It is simply one suggestion of many different ways to integrate Internet research into the classroom. For me, I find it simplifies the process, and pulls together multiple resources for content research and generation. Enjoy!